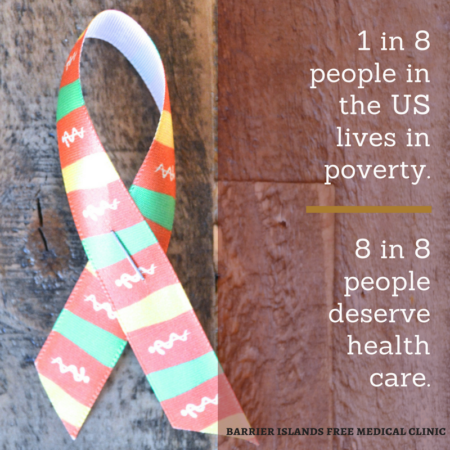 Barrier Islands Free Medical Clinic, based out of Charleston, SC, provides free health care to low income, uninsured community members who live or work on Johns, James and Wadmalaw Islands. Our patients are primarily the working poor; many who work long hours – or several jobs – but receive no health insurance through their employers and make wages that fall below 200% of the federal poverty level. We are able to offer free, high quality health care to our patients due to the volunteer commitment of lowcountry physicians, nurses, and administrative assistants. All funding for the clinic is provided by those in the community who care: nonprofit organizations, local chapters and clubs, places of worship, and every day folks who hold the lowcountry community in their hearts – both near and far. If you are unable to make a financial gift, there are important ways you can help right now. Your Gift to the Clinic ensures happier and healthier families across the lowcountry, making our community a better place to live for everyone. If you are able to make a charitable donation, 82 cents of every dollar goes directly to patient care, while the remainder assists in our clinic operations. Donate Today. Every Amount Helps. Share This Post. Copy this link: https://www.bifmc.org/show-charleston-cares/ and post to your social media channels so others can learn more. Tag #CharlestonCares! Tell a Friend without Health Insurance About Our Clinic. BIFMC is here and ready to receive new patients, but not everyone has heard about us. Share our eligibility page with a friend, or provide them with this resource for other Charleston area clinics. Start Your Own Fundraiser on Facebook. Anyone can help raise money through Facebook’s new “Donations” feature. Simply click “What’s on your mind?”, scroll down your option list, and select “Donations” at the very bottom. Type in “Barrier Islands Free Medical Clinic” and the proceeds raised from your page fundraiser will be donated to BIFMC via Network For Good. Follow BIFMC on Social Media and Help Spread our Mission. Find our online presence here. Every like, share, or RT helps get the word out about our free health care clinic. You never know who you may be connected to on social media who currently does not have health insurance: Many young people who work in restaurants, area caregivers, and often parents with young families fall into this category. Join BIFMC as a Social Steward and get to work from the comfort of home! Print Out Our Informational Cards and Leave Them on Local Sign Boards. You can download and Print This Eligibility PDF card, cut in half and leave on local community message boards, in libraries, or other public venues where informational pamphlets are permitted. Leave BIFMC a Facebook or Google Review. Your reviews help to inform potential patients about our free services. A Google review will help push our free clinic listing up in search engine rankings so uninsured adults can find our services when in need. Leave a Google review here, or find us on Facebook to provide a rating and commentary. Host Your Own Party or Event as a Fundraiser. Any gathering can include a charitable spin and help raise funds to support the Free Clinic. Find ideas on how to party with a socially conscious flair here. Volunteer, or Pass our Volunteer Information on to a Health Care Professional or Advocate. You don’t have to be a healthcare professional to volunteer at the clinic; learn more here or apply online as a medical or non-medical applicant. Sign Up For Our Newsletter. Let us know you’re a BIFMC supporter, and sign up online to receive important updates on the Clinic via your inbox. Getting the message out is critical to our mission of serving the health and wellness needs of those who live or work on Johns, James and Wadmalaw Islands but cannot afford to put their own health first. Your stewardship of our Free Clinic, whether financially or as a vocal advocate, saves lives. Thank you for your efforts to prove that #CharlestonCares.